removal, that further discussion would add little of value to the wealth of material there collected. cases is seldom completely investigated. understood with the limitations put upon them by the opinion in the Cohens case. See also Carroll v.
Lessee of Carroll, 16 How. 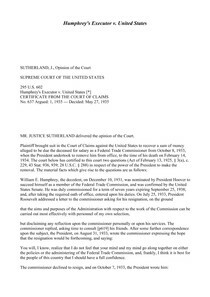 275, 286-287; O'Donoghue v. United States, 289 U.S. 516, 550.
in office only at the pleasure of the President. independence against the latter's will. his own house precludes him from imposing his control in the house of another who is master there.